It seems my Piedmontese tour is not getting off the ground so I’m posting one more Italian appetizer, although not related to Piedmont. 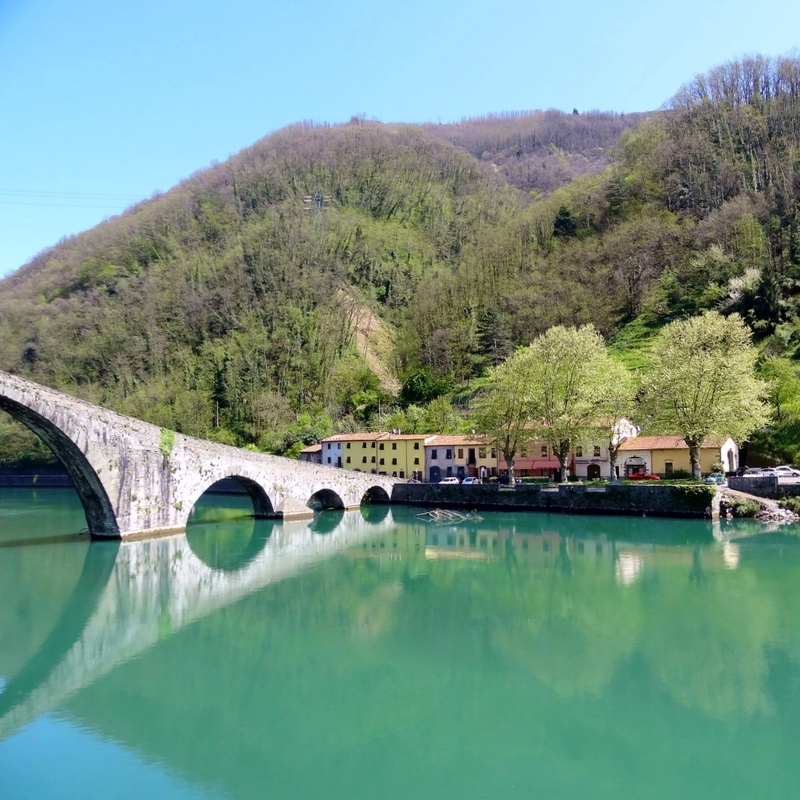 A few years ago in April, we were driving northward from the town of Lucca following the river Serchio towards the valley of Garfagnana in northwestern Tuscany. Suddenly this view opened up before our eyes. 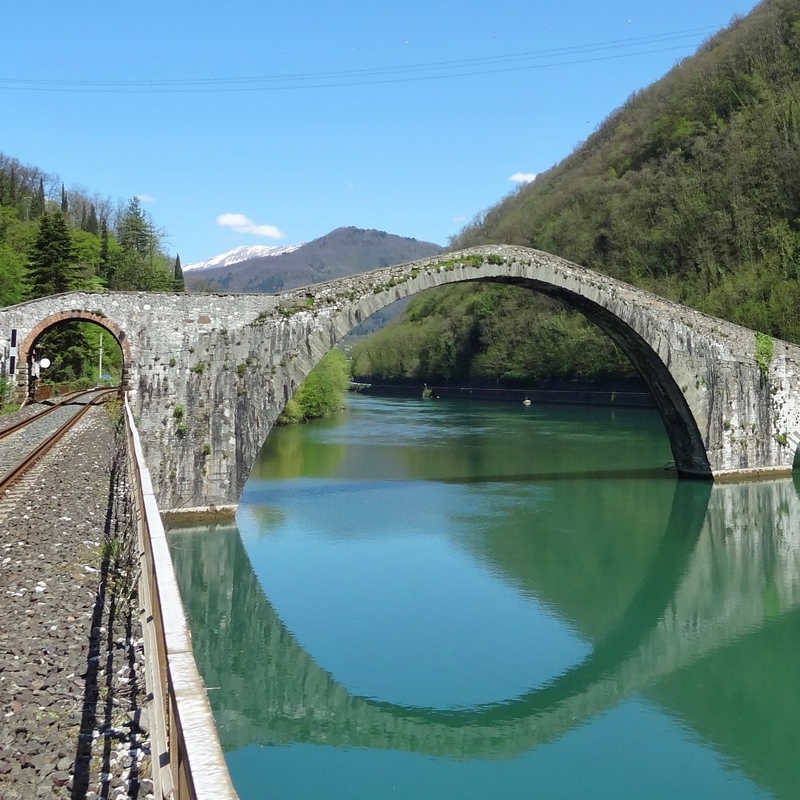 This is Ponte della Maddalena near the small town of Borgo a Mazzano. 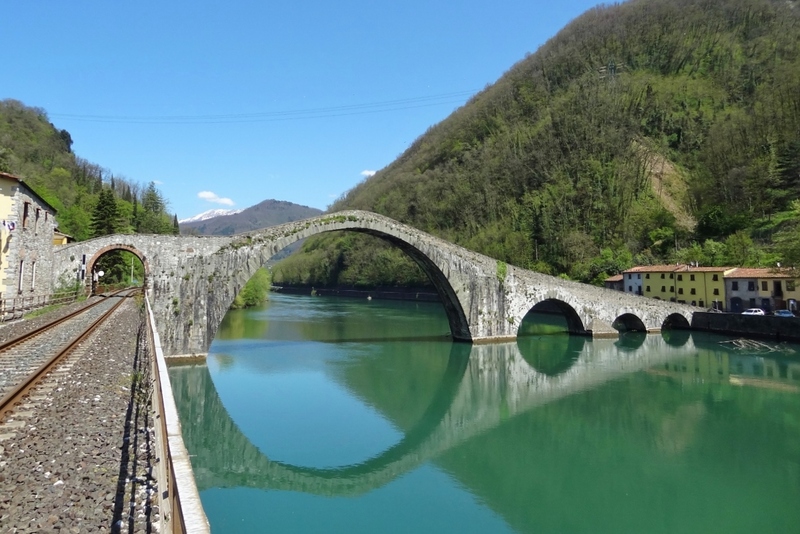 Just like many other ancient bridges in Italy, it is also called Ponte del Diavolo. This striking example of medieval engineering dates back to the 12th century its largest span measuring 37.8m. It has been renovated several times over the centuries. Some one hundred years ago, an arch was added to make space for the riverfront railroad. I am so lucky hubby is always rather gracious at hitting the brakes at my request. 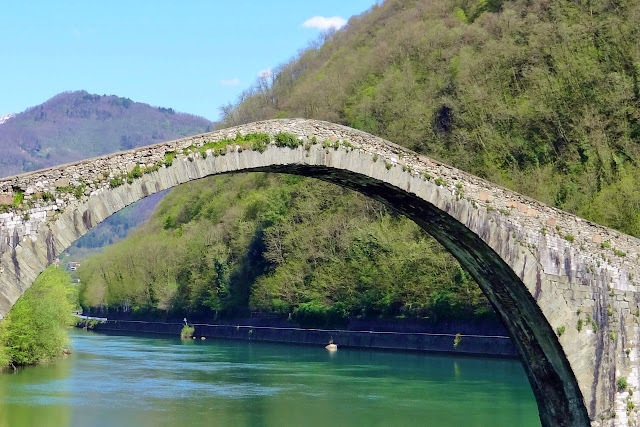 This historical monument is far too fabulous to have been left unrecorded, don’t you think? Hit the brakes, dear! (1) under this link. 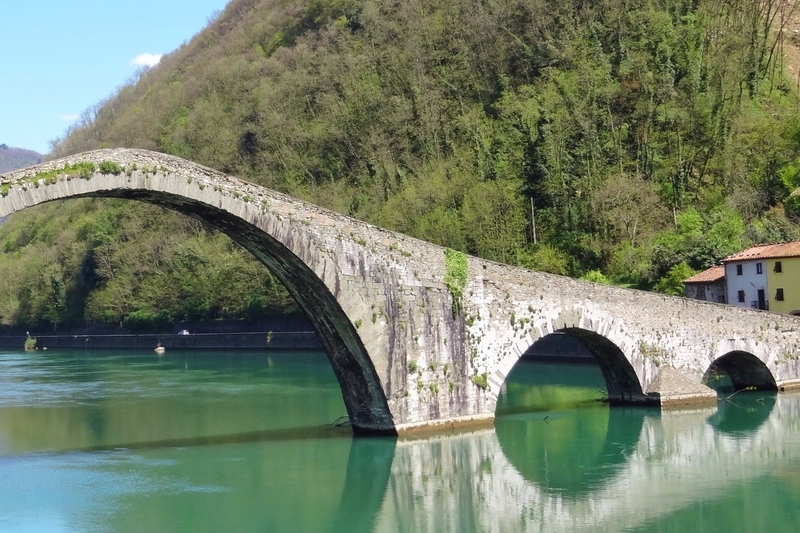 I know that bridge too, and also saw it whilst travelling to lovely Lucca. My husband is very good at hitting the brakes too, they are good to us aren't they? Aren't we fortunate! My ex-husband wasn't that good at stopping the car unexpectedly but I guess it isn't fair to compare the digital age with the 1980s and 1990s when photographing was completely different. Indeed. Moreover, we generally travel off season, which adds to the possibilities of suddenly stopping by the roadside. It is always a joy to see something ancient this well preserved. 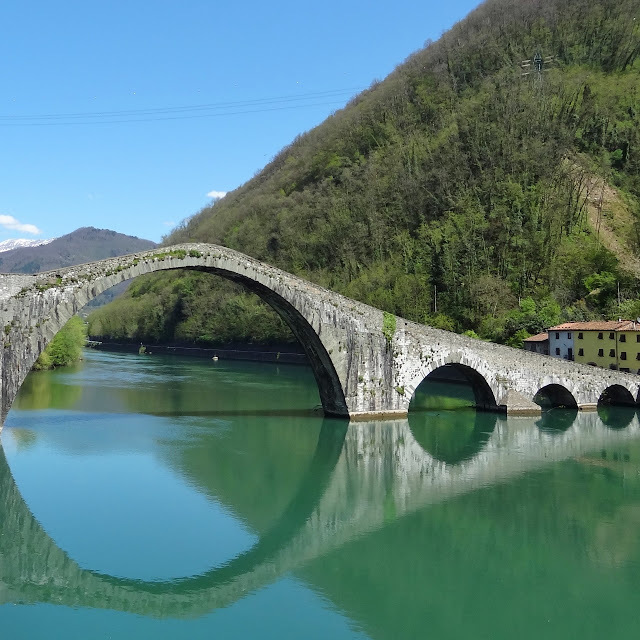 The medieval bridge builders certainly mastered construction engineering. We were quite lucky with the sunshine and pleased we happened to be driving on the railroad side of the river.